My Lords, it is widely agreed that all statements that tend towards causing hatred, contempt and violence towards other faiths should not be permitted, but does the Minister nevertheless agree that it is not extremist in any way, and should in fact be encouraged, for there to be statements that are frank and categorical assertions of faith or no faith, and that there is no right not to be offended or hurt by such statements? This is a laudable prima facie assertion of religious freedom and a sterling defence of the right to offend – except, that is, for two words. We can all agree on the Millite principle of limiting personal freedom at the threshold of causing physical harm to others or damage to property. But statements that tend towards causing hatred? Statements that tend towards causing contempt? What is the non-violent apprehension of hatred in the mind of the martyr? Even more nebulous is the subjective assessment of non-violent contempt. Does the right to offend really cease at the feeling of a religious belief that is derided or despised? I agree on the whole issue of interpretations and the right not to be offended, because after all that is what we are protecting here in our country. I think that there is a distinct line to be drawn when it comes to any conservative practice of a particular religion. Indeed, my right honourable friend the Prime Minister is on record, when referring to Islam in particular, as saying that anyone who is devout of faith can be anything but an extremist. The right to offend someone and not to be offended remains a value that we wish to protect, but we need to stand up to those who seek to divide us and to create division between society and faiths. That is certainly what our counterextremism strategy is all about. So, the right to offend remains a value worthy of protection, but (and it’s an alarming conjunction) that historic right, for Lord Ahmad, ceases at the point of causing division. Didn’t Jesus say that he came to cause division? For I am come to set a man at variance against his father, and the daughter against her mother, and the daughter in law against her mother in law (Mt 10:34f). The father shall be divided against the son, and the son against the father; the mother against the daughter, and the daughter against the mother; the mother in law against her daughter in law, and the daughter in law against her mother in law (Lk 12:51ff). Didn’t he show a certain contempt for hypocritical, faithless or false manifestations of religion? Woe unto you, scribes and Pharisees, hypocrites! for ye are like unto whited sepulchres, which indeed appear beautiful outward, but are within full of dead men’s bones, and of all uncleanness (Mt 23:27). Might not the words of St Paul be interpreted as hatred by those who are feeling convicted of their sin and condemned? Nor thieves, nor covetous, nor drunkards, nor revilers, nor extortioners, shall inherit the kingdom of God (1Cor 6:9f). If we may not express contempt for what we believe to be false religion, we are obliged to respect it, if merely by the choice of self-censorship. Is it contempt to state that Mohammed was a false prophet? Is it divisive to repudiate the revelation claimed by Islam? Is it an expression of hate to point out that the Qur’an is replete with hateful and divisive surahs which are contemptuous of other faiths and grievously offensive to non-Muslims? Is not the preaching of the gospel an offence to unbelievers? ‘And I, brethren, if I yet preach circumcision, why do I yet suffer persecution? then is the offence of the cross ceased‘ (Gal 5:11). The cross is offensive when salvation is preached, and that salvation is divisive, for there are sheep and there are goats: some are chosen, and others are not. ‘..And a stone of stumbling, and a rock of offence, even to them which stumble at the word, being disobedient: whereunto also they were appointed..‘ (1Pt 2:8). What should be the irenic Christian response to the quranic assertion that Jesus was not crucified and did not die; that it was a clever conjuring trick with a look-alike (sūrat l-nisāa 4:157)? 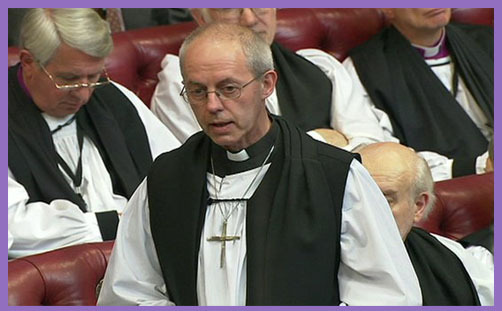 If, as the Archbishop of Canterbury enjoins, we may respond with “frank and categorical assertions of faith” (ie, that this surah is deception, fabrication, false prophecy and a lie), and to do so “is not extremist in any way” (“and should in fact be encouraged”), what of the possible reaction of Lord Ahmad and some of his co-religionists who might find such “frank and categorical assertions of faith” more than a little hateful, contemptuous or divisive? That must include non-violent expressions of ‘hate’ and statements of ‘contempt’. It must certainly include the expression of religious beliefs which may cause division. If it does not, the secular state simply defines religious ‘extremism’ as that which conflicts with culturally orthodox utterances; and so to proclaim the counter-cultural gospel of Christ and the divisive offence of the Cross becomes a crime. Robust Muslims will remain free to preach the perfection of Mohammed and deride the filthy kuffar, and wishy-washy Christians, bludgeoned by ‘Islamophobia’, will go Trappist. There is, as the Archbishop reminds us, no right not to be offended, but, by God, the Church urgently needs prophets who are prepared to go to the stake for really doing so, rather than merely intoning the intellectual right to do so which is no offence to anyone.